Stereolithography, a technique of additive manufacturing for prototypes, has advantages as well as limitations. To help you get the most from this rapid prototyping technology and judge whether it might be appropriate for your prototyping projects, we detail some of the advantages and limitations of stereolithography below. High precision, fine detail: due to the great thinness of each layer applied in stereolithography (0.05 to 0.10 mm) and the fine laser beam, it is possible to obtain prototypes with a very realistic finish and complex geometric shapes. Quality of the part: despite the use of substitution materials (resin), parts made with stereolithography have good functional surface quality. Smooth finish: In stereolithography, the resulting parts have a smooth finish, with the option to choose between a number of resins for different renderings. From the smallest to the largest: with stereolithography, it is possible to create small parts with high definition, as well as larger parts up to two metres in size, while maintaining high precision. Price and deadlines: By choosing the stereolithography method, you can obtain a part in about two days, because the 3D files are sufficient to launch a printing. On the other hand, the cost is reasonable, because it is not necessary to create a mould, as stereolithography works by adding material. 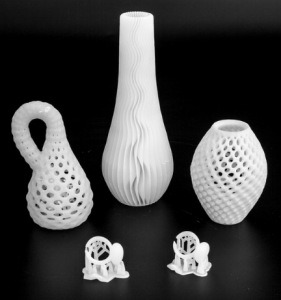 Fragility: stereolithography uses equivalent materials which are resins. The parts thus obtained are more fragile than the final parts. If the quality of the finish allows functional prototypes to be obtained, stereolithography does not, however, allow parts that can be used for mechanical testing to be obtained. Expensive machines: if we had predicted the boom in 3D printing in the past few years, experts have neglected the cost of the machines and the difficulty of their operation. Thus, it is more difficult for companies to create their own prototypes in stereolithography, so they often prefer to rely on specialised companies. Unit production: due to the time required to produce a part, the use of stereolithography is limited to three copies, so it does not make sense for mass production. For more information, please contact us via our quote request page. Can a strong, hard plastic part with a molded- in/insert molded blade, like a small paring knife, be made using an SLA process? The blade will be made with substantial through-holes to allow interlocking.